Wonderful clothes have been turning up for me in the past few months, and I want to alert everyone to some great brands and styles. Bogner jackets and Fire and Ice sportswear. Bogner? Two months ago, I’d never heard of Bogner. Then I found a beautiful wool blazer in a heathery periwinkle color at Classic Consignment in Ballard for $20. It had a metal charm attached to the front pocket — a bright silver “B” — that made it look more like sportswear than a dressy jacket. Some online sleuthing revealed that it was a casual jacket from a company best known for skiwear — Bogner, a European firm. The tailoring and fabric are exquisite. The price, had I bought it new? $400. The story is just beginning. A few weeks later, at a flea market, I spotted a cherry red micro-fleece half-zip top that looked like a great style for me. The label? Fire and Ice. Which, it turns out, is a part of…yes, Bogner. (Price online? $200. I’d paid $5.) Not only are the beautiful pieces of clothing, but size 12 (or Large) fits me perfectly. Definitely items for petite women. Check out the vaguely steampunkish Lindsay blazer, currently selling for way above my budget. Vintage Pendleton jackets. At Goodwill I snagged a gorgeous Pendleton blazer, a lightweight pale-champagne Harris tweed, petite, for $14. I’ve gotten so many compliments on it that I’m now searching Etsy, eBay, and all the thrift shops for more of them. A lot of vintage Pendleton is in bold colors or plaids that aren’t quite me (shocking pink and forest green check, anyone?). But I’m going to be patient to get this fit and quality. Moving Comfort Maia sports bra. For years I’ve been wearing Moving Comfort’s wire-free Fiona sports bra for yoga (after being stabbed savagely by an expensive underwire sports bra while doing twists). The problem with the (seemingly indestructible) Fiona is that they don’t make it in my size, so I’ve been wearing it one cup size too small. It squishes me, and I look…squished. I’d tried a few other Moving Comfort bras but hadn’t liked them. One, which seemed to be made out of latex, was difficult to get on, and nearly impossible to get off. But I decided to try the Maia bra, which does come in my size. It is very tailored, and works as a camisole with V-neck shirts and sweaters. It is so comfortable, even with underwires, I feel like I’m not even wearing a bra. And it looks so good I’m now wearing it with dressy clothing as well as for yoga. Question: Why don’t they remove the little white sports logo from the strap and sell this as a regular bra? They’d make a fortune. Eddie Bauer Pima Cotton 3/4-sleeve T-shirts. Another big win, particularly if you buy them on sale. These are fairly long shirts, but Eddie Bauer has moved away from the skinny fit, and these are just lovely. 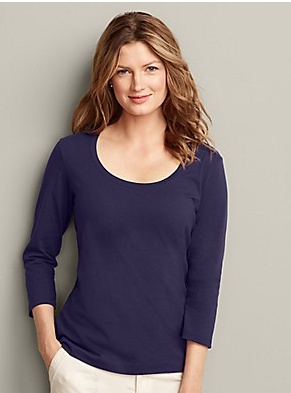 I ordered petites and the V and scoop necks were the perfect depth and width (unlike the necklines on the “petite” shirts at the Gap, which are apparently designed to reveal as much of your bra as possible). JCP (aka J.C. Penney) a.n.a. sportswear. Having read all about J.C. Penney’s controversial new business model, I decided to check it out. It’s now a store full of fashion boutiques with very, very, very inexpensive prices (and somewhat confused-looking customers, wondering what happened to the old system of long racks full of sales merchandise). I bought two jackets from the a.n.a. (“A New Approach”) petite boutique, which mimics a Ralph Lauren style. They were about $3o each; one is a nicely shaped workshirt in a featherweight, faded denim and the other is an attractively styled army-green fatigue jacket, also in a summer-weight fabric. My one complaint: an XL petite is almost too tight for me across the back and bust — and I’m a size 10 petite at Eddie Bauer. This is definitely a place I’ll check again for inexpensive summer clothing. Eddie Bauer’s long-awaited Travex pants for spring are a disappointment. Last year’s Travex pants sold out almost immediately, were not restocked, and still command full price on eBay. They may now become collectors items, because the 2013 version of them is simply not as good. The new 2013 capris have those yoga-style flare-out hems (calf-length bell bottoms? Really?) that look bad on everybody. (Last year’s had drawstring hems you could adjust.) And they have this unattractive zig-zag top stitching everywhere that looks like a second grader sewed them. I’ll resume hunting for another pair of last year’s on eBay. (Note: The waistband on the Travex capris is a bit low — if you’re a petite, you could go for the regular size to get a slightly higher waistband. >Eddie Bauer changed the cut of their jeans a year or so ago, as did the Gap, and I haven’t been able to find cute, comfortable jeans to wear. The new Eddie Bauer jeans look awful on me and the Gap jeans look great in the dressing room but when I get home they are just too low-cut to be comfortable or practical to sit down in. I’d just about given up when I stopped in at Buffalo Exchange (a thrift shop chain focused on clothes for 30-somethings) on the way back from the Ballard Sunday Market. I spotted two pair of jeans, tried them on, and loved them both. The best pair was called Kut from the Kloth. The saleswoman raved about them but said the were no longer in production. I bought them — for $19. Fortunately, the saleswoman was wrong. They’re still going strong, and Macy’s carries them in Better Denim (remember “Better Dresses”? Now it’s “Better Denim.”), and you can find them on eBay. Turns out I’m not the only person who thinks Kut from the Kloth is the gods’ gift to the short, curvy woman. Check out these reviews from The Demoiselles and Cleveland’s Shopaholic blog. The one caution about Kut jeans? Watch out for the ones with the flaps on the back pockets. Ugh. >No, this isn’t a post about fitness and knees. It’s a post about women’s fashion — specifically, pants. I was standing in my walk-in closet this morning trying to figure out why a pair of Eddie Bauer corduroy pants I bought two years ago look great, and why a pair I bought four years ago (same corduroy, same size) look dorky. They have the same fit at the waist and hips, and the hems are the same width. But the newer pair looks hip and trendy and the older pair — they’re not quite “mom jeans,” but definitely dumpy. Finally I figured it out. It’s the knees. Current fashion includes both skinny jeans (tight everywhere, including the ankles) and flared jeans (wide at the ankles). But both styles are slim at the knees. Older pants, which were straight from thigh down to ankle, now look like something you’d see on a gardener or someone cleaning out their basement. I packed the older pair away. The style will be back in two or three years and, somehow, they’ll look just right. And I’m not just being snarky: Last week I had people raving about a pair of flat black leather riding boots I was wearing with an A-line skirt. Where did I get them? Well, 10 years ago, the last time flat boots were in style, I bought them from Santana of Canada. I nearly took them to a consignment shop five years ago when pointy toed boots were the rage, and two years ago when strange-looking heels and rounded toes were the thing. Fortunately, I held on to them. My fashion secret is a large closet and two attics. >Long ago — when you bought jeans at Army Navy stores and you weren’t in the Army or the Navy — I vaguely recall buying women’s jeans using men’s waist sizes. Today, the ultra-pricey women’s fashion jeans are being sold by similar numbers. The problem is, what’s a 30 in one brand is a 32 in another, and so on. The online fashion site Adasa.com has been putting together a guide to sizing for many of the major brands (7 for All Mankind, Frankie B, etc.). However, when you see that a size 10 is a 31, check the General Sizing Guide above to make sure you correspond to Adasa’s definition of a 10 — because it runs a good bit smaller than a 10 in a non-premium line such as Eddie Bauer or The Gap.